This message is very personal to me. As I mentioned in the last post, I am sensing [and seeing] a season of growing spiritual attacks upon Christians who are earnestly seeking a more intimate relationship with Jesus, as well as more power of the Holy Spirit in their lives. I am not talking about Christians who are sitting on the sidelines (and accepting the poverty of spirit as their daily penitence), but Christians who are [out of obedience] boldly pursuing the calling on their lives to advance God's Kingdom here on earth. I know that many Believers sincerely hold fast to a theology that says, "If I just have enough faith, then I can get through this life without any suffering, or testing, or attacks from Satan that will have me questioning God's presence". But all we have to do is look at the Bible to see that is not true. Abraham, who is called the Father of our faith, endured perhaps the most difficult test any Believer in YHWH has ever faced ... the command by God to sacrifice his beloved son. I think it is safe to say that Abraham's faith in that situation would be tough for any one of us to imitate. Yet, because he stood firm in his faith and obedience, we have the opportunity to stand firm in ours. And Satan absolutely detests that kind of faith; the kind of faith that threatens his rule of the earth. So when obedient Christians answer the call of our God, we can expect that the Enemy will try to distract us, or forestall that calling by coming against us. 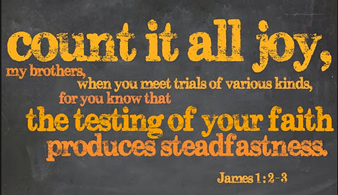 But we must also realize that God tests those He calls. Hebrews 12:6 tells us, For the Lord’s training of your life is the evidence of his faithful love. And when he draws you to himself, it proves you are his delightful child (The Passion Translation). I much prefer this translation to the more common translations that say God "disciplines those He loves and punishes [chastises, scourges] those He accepts". I do not believe those are accurate translations because the Aramaic word for "scourge", which is nagad, can also mean "to attract,” “to draw,” or “tug the heart.” For me, that is a more accurate picture of my Abba, the God I serve. And to take the word analogy one step further, isn't the result of training always a test to see what you've learned? Whether you are a Doctor in your Residency training; or a member of the Military in training at boot camp; or an athlete training for the Olympics or NFL, each one is being trained up in order to pass a test before they advance to the next level of their line of work. Well, as Ambassadors of the Kingdom, I believe that God trains us (and tests us) before He advances us to the next level of our calling. So, I would say to any of you that are certain that He has called you into service to the Kingdom, that you can expect times of testing -- both from the Enemy who will try to convince you that you aren't fit for your calling, and by your Father and your King as They train you up to run the race that you are called to. And I can personally say that Mark and I have experienced both this past week. Last post, I alluded to the spiritual attacks that were coming against us. My husband, uncharacteristically, was suffering from bouts of anxiety, resulting in rapid heart rate, lack of sleep, etc. Normally, his steadfast faith would identify an attack from the devil and he would bind those spirits, declare the word of God and loose heavenly resources, as is his inheritance as a son of God. But this time was different. None of his usual spiritual battle techniques [in Jesus] worked, and my prayers and battles in the spirit would result in minor victories, but the heaviness continued over us. Mind you, at no time did we every doubt that God was with us or that we would be victorious in Jesus. We spent most of our time trying to figure out the meaning or purpose of what we were experiencing. Our faith was secure; it was just clear it was being tested. I kept asking the Holy Spirit to reveal what was going on in the spiritual realm so that we could take our authority over it and walk in our true identity -- our spirit was clear who we were, but the flesh was not cooperating. Finally, I got a clue ... we had scheduled a meeting to disciple a young couple in deliverance ministry, and I discerned that this was perhaps an obstacle set in place to diminish the authority and power we had to minister to them, and to defeat their desire to know about this particular service to God. I was partly correct. We approached our meeting with this couple in the mindset that nothing would stop us from sharing what the Lord has revealed to us. We take seriously the Lord's admonition that He needs more workers in His harvest fields, and here were two people willing to join us in bringing in that harvest. No matter what the Enemy was throwing at us physically, or the spiritual confusion we were experiencing as to the "whys", we were determined to glorify all that we had seen Jesus and the Holy Spirit do in the lives of dispirited and oppressed people. What we didn't account for was that these faithful Seekers would bring a friend with them. And it quickly became clear that this friend was the focus of this Divine Appointment. He revealed that he had been delivered a few months earlier, and he knew the value of it and wanted to know more, but hinted that his healing had not been complete. As we continued to answer questions about our experiences, we shared that it is always the desire of the Father's heart that those held in captivity by the Enemy be set free. We related that we had seen that most everyone has spiritual wounds that need to be healed [either from sins they have committed, or sins that have been committed against them], and that Jesus and the Holy Spirit are looking for obedient sons and daughters to partner with Them to bring that inner healing and freedom to all that need it. We mentioned that a common wound we had seen was child molestation. At the mention of this sin, the friend became emotional. He stated that he was getting uncomfortable. I gently asked him if this sin had been committed against him, and he confirmed it. We told him Jesus wanted to heal that wound and if he was willing, we'd like to help make that happen. He agreed to accompany me to a private place where we could invite Jesus in, while Mark remained with the Seekers, who by now were beginning to realize that this visit was planned by God and had a bigger purpose than they had anticipated. To make a long story short, from the outset, it was apparent to me that this was going to be a spiritual battle of bigger proportions than we have experienced in the past. But I want to stress that there was no fear on my part as I began the session, knowing full well that the power of Jesus and the Holy Spirit were greater than anything we would face from the kingdom of darkness. And this young man loved Jesus with a heart and spirit that was so convicted -- but also in great conflict. He admitted to opening doors he knew were wrong and that he had grieved Jesus, and the temptations to sin were overwhelming him. He was literally in a battle for his mind, spirit, and soul. The Enemy had him trapped in the sin of homosexuality and was torturing him! But he wanted free! And as I led him in forgiveness against the man who had sinned against him in childhood, and broke soul ties with whom he had sinned, the Enemy launched a full scale assault. I do not want to sensationalize what happened next nor compromise his privacy, so let's just say that it quickly became a physical battle as well as a spiritual battle. While the wife of the seeker couple prayed separately, it took Mark, myself, and the husband to battle the multitude of spirits that tried to prevent their friend from becoming free. But none of us battled from a spirit of fear or doubt! Rather, we stayed calm, but forcefully proclaimed the Truth that He who is in us is greater than he who is in the world, and in the Name of Jesus, the Enemy and his demonic spirits were defeated. They must leave! Needless to say this young man had given legal authority for strongholds to take root in his life, and they weren't leaving easily. 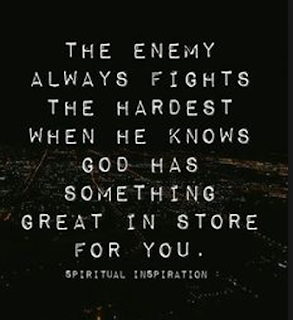 But he recognized that, and fought in the spirit, too, and after a long battle, he was victorious in Christ! When we asked Jesus to show him how he appeared to the Lord, through tears, he stated, "I am radiant! Everything looks brighter!" Hallelujah! I want to make sure that you understand why I have bothered to relate this episode. It is not to boast about our part in the victory that day, but rather to show you that as you begin to walk in your calling from the Lord, you can expect spiritual attacks such as the one my husband experienced. It may be the Enemy trying to distract you from an assignment, but it may also be God proving to us that our faith is real; that we are truly His children, and that no trial will overcome our faith. As we mature in our Christian walk [and our calling] it will require us to move outside our comfort zones into a larger territory that needs to be conquered for God's Kingdom. In order for us to be overcomers and conquerors in this earthly realm, we need to 1) be obedient to our calling, even when we're under attack; 2) remain patient until a breakthrough occurs, even when it seems as if God is absent; 3) increase our faith when we finally get an answer, and see just how costly [and difficult] the path forward will be in carrying out our calling; and 4) learn to stand firm against the inevitable sin and temptation that the Enemy will use to test our resolve to complete our race and calling. When God has a specific call upon your life, you know it. And if you decide to answer that call, you can expect to be tested. The Bible is clear ... Psalm 11:5 says, The LORD tests the righteous and the wicked, [exposing each heart]. 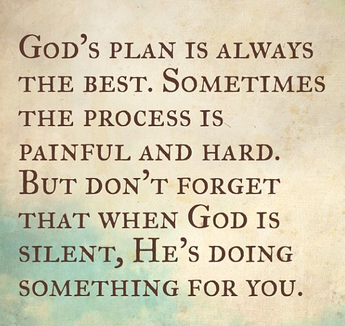 But don't get discouraged! And don't let the devil deceive you into thinking you may have messed up that calling or that God is disillusioned with your service. It just may be the exact opposite -- you are hitting the target and advancing to the next level of your service. Even Paul said [in 1 Corinthians 16:9], There’s an amazing door of opportunity standing wide open for me to minister here, even though there are many who oppose and stand against me. You can expect those adversaries to be both in the spirit and in the flesh. So, again, do not be discouraged by times of testing. God might just be training you up for a bigger assignment in your Divine destiny with Him. Remain steadfast in your faith --- and if you stumble, don't worry -- He has not abandoned you. 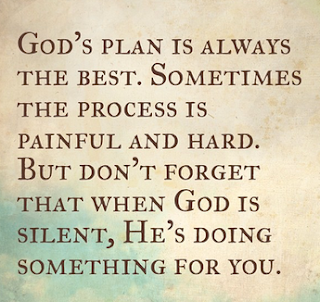 He just may need to refine you more before you receive your breakthrough. I am discerning [in hindsight] that this is what happened during that period of spiritual confusion in our life. God was preparing us for a breakthrough, and we needed to be purified and refined; continuing to walk in obedience and faith to our calling, even when our flesh was weak. By never doubting our mission, God carried us through those dark days and into an experience of greater power and authority in cooperating with Jesus to set a captive free, and bring another worker into His harvest field. Both the Seeker and the Friend witnessed the power of our Almighty God that afternoon, and both want to help bring in His harvest. Each of us was tested that day ... the Seeker and his wife to find out if they were ready to answer this specific call on their lives; the Friend who found out whether he truly desired freedom and a full commitment to his Lord and Savior; and my husband and myself, who were blessed to find that our own faith and commitment are solid and that the Lord is trusting us to take the next step. My final word is this: When you find yourself in trials and times of testing, don't think you are being punished by God. It may just be that He is bringing you to a higher calling on your life. And with that responsibility comes authority/power in the Name of Jesus... and Joy in being found trustworthy to serve the God of the Universe! And remember: there is nothing to be afraid of.... Jesus has already overcome the world! Psalm 7:9 Once and for all, end the evil tactics of the wicked! Reward and prosper the cause of the righteous, for You are the righteous God, the soul searcher, who looks deep into every heart to examine the thoughts and motives.